Founded in 1999, Casino Room attracts avid players for many reasons. A huge range of over 800 games produced by leading companies, alluring bonuses, competent support agents, excellent banking options – these are just a few advantages that are highly valued by all casino users. Mobile users can enjoy a seamless quality gameplay on the go without any downloads required, which is another plus to the casino. Casino Room is a no-download casino that provides a full compatibility with desktops and mobile devices. 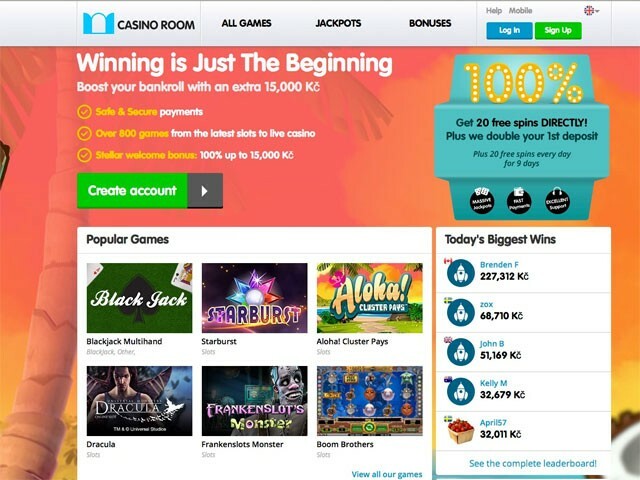 On visiting the casino via a phone or tablet, mobile users are redirected to a mobile version of the website that features streamlined graphics and full functionality as the main version. The casino contains very friendly banking options; there are no limits on depositing into casino account, and the minimum and maximum withdrawal limits are $10 (per transaction) and $10,000 (per week), respectively. Along with a live chat, email and phone, the customer support can be reached by Skype which is a fairly uncommon way of communication for online casinos. The casino is fully licensed by MGA and utilizes a reliable encryption system to protect user data. 3 live dealer roulette games. The bonuses at Casino Room are awarded for completing “missions”. Every time a user deposits money, logs in, places a bet and performs other actions at the casino, he earns comp points that can be exchanged into real cash. There are also daily missions such as to win 10 spins in a particular slot or win 3 rounds in a blackjack, etc. Every successful completion of an assignment awards comp points.